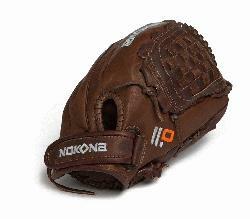 Nokona X2 Elite Fast Pitch Softball Glove. Stampeade leather close web and velcro closure back. Nokona Elite performance ready for play position specific series designed with specific fastpitch patterns. The X2 Buckaroo is made with Nokona proprietary top grain stampede steerhide and kangaroo leathers so that minimal break in is need, but the glove has great structure and maintains its shape. For elite fastpitch players who are looking the the perfect combination of top quality and highest performance. TOP QUALITY FOR HIGH PERFORMANCE: The X2 Buckaroo X2-1300 is designed for an outfielder that demanded only the best from themselves and from their equipment. The glove features a deep pocket, perfect for catching pop ups with ease, even for softball players. 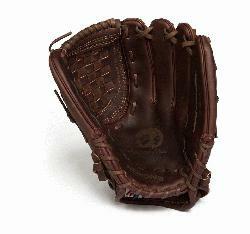 Never miss a ball with this beautiful outfielder’s glove. MINIMAL BREAK IN NEEDED: The X2 Elite is made with Nokona’s proprietary top-grain Stampede Steerhide and Kangaroo leathers, so that minimal break-in is needed, but the glove has great structure and maintains its shape. It gives you all the performance of the glove you want so you can get on the field with your favorite glove in no time. INCREDIBLE COMFORT: With just a weekend of play, you can be ready for a game on Monday with this glove. It features some of the best leather on the market to protect your hand and enhance your catching. This glove is designed to give you everything you need in a glove and is built to last as long as you’re still playing. 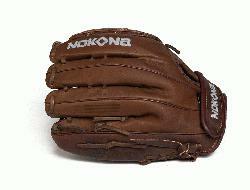 AMERICAN BALLGLOVES: Nokona is focused on the future, applying many of the same principles that have guided our past – quality, craftsmanship, innovation, integrity, and a commitment to our employees, suppliers, customers, and our country. We continue to put classic American workmanship into every glove, using techniques developed over the past 80+ years. PRODUCT SPECIFICATIONS: Package contains (1) Nokona X2 Buckaroo X2-1300 Elite Closed Web, For Right Handed Throwers. 12.00” Pattern. Closed Web. Open Back. Stampede and Kangaroo Leather. Shearling Cuff. Weight ~770g. Made in the USA.